Shields To Hammer’s Supporters: Have Y’all Forgot Who I Am? 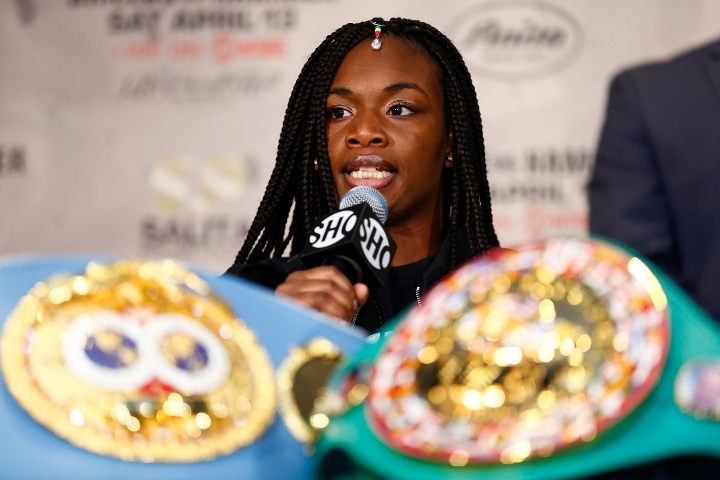 NEW YORK – The chip on Claressa Shields’ shoulder has helped put her in the appropriate, mean frame of mind mere hours before the biggest fight of her career. Like many male boxers, the IBF/WBA/WBC middleweight champion has used detractors on social media and elsewhere to provide even more motivation before she encounters Christina Hammer. The undefeated Shields is listed by most Las Vegas and Internet sports books as approximately a 4-1 favorite against Germany’s Hammer. There are those, though, that are convinced Hammer’s jab, experience and overall skill will become too much for Shields as their 10-round, 160-pound championship match unfolds Saturday night in Atlantic City, New Jersey. Shields said Wednesday following a press conference in Manhattan that such doubt about her abilities has angered her as the promotion of this fight continued. “I’m happy, but at the same time, I’m pissed off,” Shields told a group of reporters. “I’m really ready to release my rage on the inside and let it all out on her. I’m ready to prove that I am the greatest woman of all time by doing this. People are saying that I can’t do it – she’s too big, she’s too strong, she’s too experienced. The 24-year-old Shields (8-0, 2 KOs), of Flint, Michigan, and the 28-year-old Hammer (24-0, 11 KOs, 1 NC), of Dortmund, Germany, were supposed to fight November 17 at Boardwalk Hall in Atlantic City. Hammer had to postpone their fight almost immediately after it was announced late in September because a stomach condition prohibited her from training properly. Their middleweight title unification fight will headline a “ShoBox: The New Generation” tripleheader on Showtime on Saturday night (9:10 p.m. ET).